Please do your part to keep all our children safe. The speed limit in school zones is 30 km/hr. 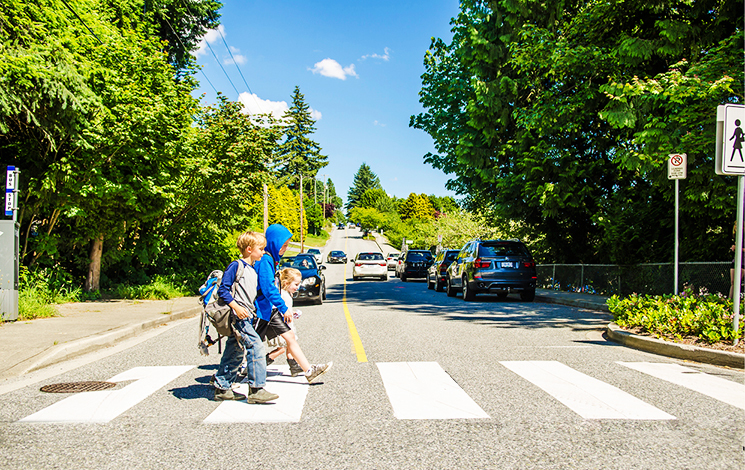 By slowing down, obeying signage, and using extra caution when driving in or near school zones, you can help keep our school zones safe during the school year (September to June). Fewer cars around schools reduce congestion, traffic conflicts, and improve student safety. Choosing active transportation like walking or cycling to school is good for students' health and cuts down on greenhouse gas emissions for a cleaner environment. A joint School Traffic Safety Advisory Committee (STSAC) meets regularly to review challenges to traffic safety and movement around schools and to recommend improvements to engineering, education, and enforcement. Check out these resources to help reduce traffic congestion and improve safety at your school. Learn more about the joint School Traffic Safety Advisory Committee.